Every once in a while I delve into the non-game side of the Xbox Live Indie Games catalogue. “Utopioneer Games”, best known for their “Hack This Game” series (as well as “Code Breaker”), is also the developer of “Spanish 101” and “German 101”, which I have previously reviewed. 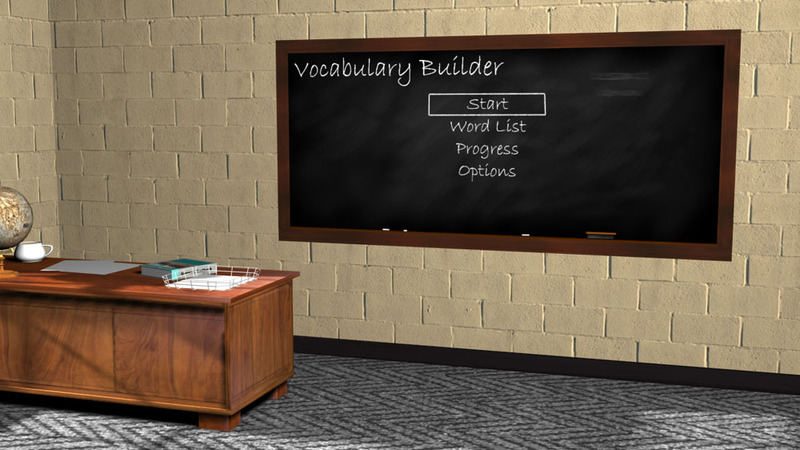 “Vocabulary Builder” is based off of those foreign language efforts, but focuses on English vocabulary building. It tracks your progress day by day, and is customisable for difficulty level. Potentially useful both for younger students, as well as for people learning English as a second language, or even just for those who have a great command of English but want to ramp up the difficulty level and improve it further, this has the advantage (that a language learning book or CD set doesn’t) that it tracks your progress. Worth 80 Microsoft Points if you think you can get some use out of it. Vocabulary builder is is interesting project. I have some tips to learn vocabulary better. My favorite app is Superflashcard. It would be very nice of you if you could try and write a review about it. I’m sure it’s a very interesting and effective studying tool, at least for me. I’m not familiar with Superflashcard, is it an Xbox Live Indie Games title?